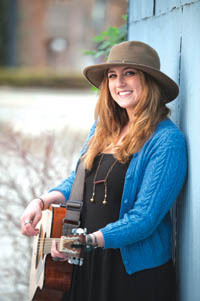 When 22-year old singer-songwriter Isabelle “Izzy” Taylor took to the stage at the Sun Valley Brewery in Hailey in February, there was quite a bit of loud conversation going on at the bar. Taylor eyed the audience, or lack thereof, and began to sing, a cappella, a version of “Drinkin” by Holly Williams, a heart-rending song about a cheating lover. Heads turned and the bar grew silent, giving way to Taylor’s powerful voice. By the song’s end, there were heads bobbing and a round of applause. “‘Drinkin’ is a woman’s power song,” Taylor said in an interview last week. a soon-to-be released CD titled “Walkin’ Way,” produced by T.J. Masters at County Q Studios in Nashville, Tenn.
Taylor is the daughter of Hailey residents Aaron and Salome Taylor. She grew up singing under the tutelage of Company of Fools Music Director R.L. Rowsey in the Sun Valley Music Conservatory. She graduated from Wood River High School in 2010. Taylor was born in Livermore, Calif., in 1991, near her grandparents’ boutique winery. The tracks on “Walkin’ Way” range from rowdy and defiant to melancholy and philosophical, telling age-old stories of young love gone awry, and the call for adventure. Pete Kramer, a director of the Northern Rockies Music Festival, invited Taylor to play at the event at Hop Porter Park in Hailey in 2012 and 2013. Playing in front of an enthusiastic crowd opened Taylor’s eyes to the need to perform. “Writing helped me to brood. Performing live helped me to release the emotions,” she said. A lucky break last summer could ensure that Taylor has a real shot at making a living in the music industry. While working in Hagerman at a horseback-riding therapy camp, she made friends with another musician in the group. “We had a cup of tea and he insisted that I play a song. All the sudden he got up and walked out of the room,” Taylor said. Three weeks later, Taylor was in Nashville, surrounded by professional studio musicians Paul Scholten, Wanda Vick, J.T. Corenfloss and Idaho musician and sound engineer Rob Matson. Producer T.J. Masters also played on the album. Taylor said almost everyone in the studio in Nashville sang along for the last verse. “It was a magical moment for me. I hope other people can feel and relate to that moment, too,” she said. Taylor’s formidable voice and passionate lyrics on “Walkin’ Way” are carried on a silver platter by the crew at County Q Studios. But where will Taylor’s talents take her now that she has a professionally produced example of her talents? She opened up for Zach Herbert’s St. Terrible at the Crux in Boise in February, and played at the Artists’ Parlor on Sun Valley Road during a gallery walk event two weeks ago. Taylor plays regularly at the Power House restaurant’s “pow wow” on Tuesday nights in Hailey, when she isn’t waitressing. For more information about Taylor, go to www. izzytaylor.bandcamp.com.